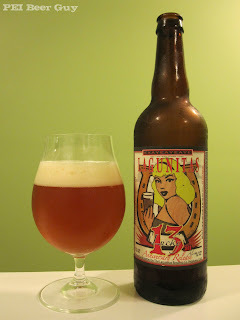 A while back, I reviewed Lagunitas' Lucky 13 Mondo Large Red Ale, the cousin, or predecessor, to this, if you will. I thought it was an excellent beer. Now from Lagunitas is the "anniversary version" of their Lucky 13. Not a red this time, but an ".alt" - an American strong ale (not an altbier as some thought). Many (most?) folks on BA report this to be mostly golden yellow (hunh?). This ale is a fairly rich, crystal-clear orange. Scratch that. I probably say crystal-clear too often (like many people). This stuff is clearer than an obvious, relatable simile - it's as clear as a glacial lake (aw yeah). The head is decent, pale apricot in colour, and a bit creamy. It leaves some pretty solid lacing. Much like the Mondo Large Red, the smell is of pineapple... like that roasted pineapple on a ham (minus the ham), maybe with a cherry or some raisins on top... and of sweet, red candy apple. Some malty sweetness comes through, too, in the form of milky caramel (not that clear Caramilk stuff). There is just a hint of the 8.9% alcohol in it. Flavour-wise, this one didn't quite live up to my expectations. It's still good, but it just doesn't wow me. Expect pineapple, candy apple, and some lightly rich malt notes... toffee, perhaps. There is some heat / burn from the alcohol in the feel, which is too bad. This could have been balanced out a bit better. Other than that, the feel is fine. It's a little viscous/slick, with a surprisingly clean and mostly "no-finish" finish. The impression that's left is the heat and the malt notes, along with some bitterness. Overall, this beer was good. Maybe a bit better than good. Unfortunately (at least for me), there's just too much out there (the Mondo Large Red included) that I think is better. This post was brought to you by bracketed asides and italics.